Think you don’t have anywhere to put a fireplace? Think again. Whether you live in a condo, an older home with small rooms, or are simply running low on available space, these three fireplaces will bring comfort and style to your living space. The Revo Series by Heat&Glo includes efficient gas fireplaces with no footprint. They are lightweight and just seven inches deep, so you can simply hang one on the wall or even recess it. The Revo Series comes in square, horizontal and vertical models; so when we say these fireplaces can fit anywhere, we really mean it! And to top it all off, Revo fireplaces come in several different designer fronts and finishes. The reflective black glass interior creates the illusion of depth, and Heat&Glo’s patented Razor burner adds style and flair to this little powerhouse. If you’re looking for the perfect combination of efficiency and design for your small space, you have to see the Revo Series fireplaces. 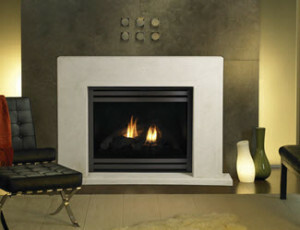 Next on our list is another gas fireplace line by Heat&Glo: the Slimline Series. 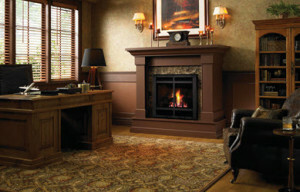 What we love about these fireplaces is their versatility. A variety of footprint sizes and a slender profile allow you to install one nearly anywhere, including corners and other difficult spaces. The Slimline Series fireplaces have a beautiful flame and come in many different front options to go with the décor of any room. It’s also a solid heater for small spaces. Thanks to modern technology, these fireplaces can fit almost anywhere and give a contemporary or more traditional look—your choice!—to your space.